With a 45 minute delay for floodlight failure, our game kicked off when most were beginning their half-time break. 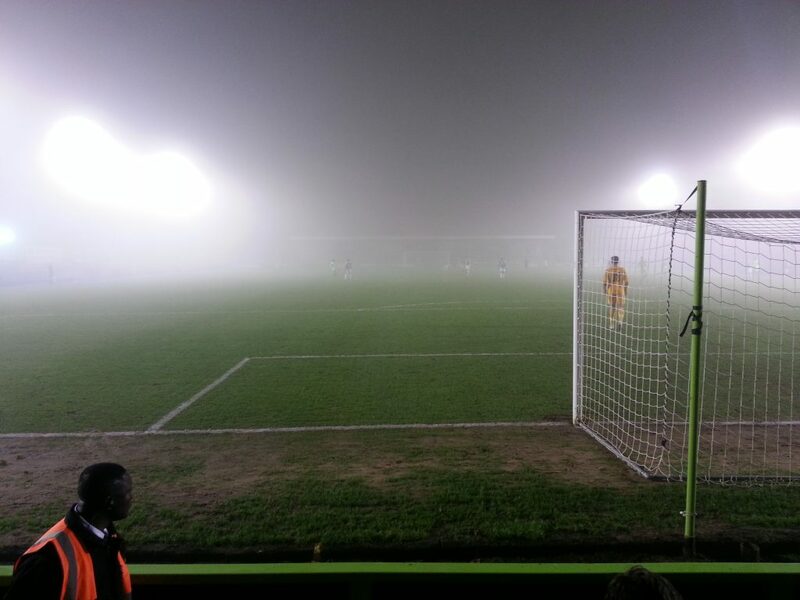 By the beginning of the second half began, fog was so thick, the goalpost at the far side was completely invisible, as were all the players if they were past the halfway line. I cannot believe a linesman on one side of the ground could see his counterpart. If the ball came to our end of the ground, it seemed to emerge from nothingness, with a bunch of people chasing shadows. Had we not already stood around for several hours and if the opposition were more local then the eight-hour round trip they had made to be here, then surely the ref would have called off the game. But we all stood and cheered and froze from our feet upwards, shifting our shoes on the cold concrete terracing, peering through an English winter at its bleakest for a moment of magic, a spark of inspiration.